This basin is characterized by the El Bouri oil field. This is the largest giant oil field discovered (1976) in the Mediterranean Sea. It has 2 billion barrels of proven oil reserves and is producing from the bioclastic nummulitic limestone of the Lower Eocene Jdeir formation. This formation represents an accumulation of a nummulitic bank with a middle ramp setting and is 100 m thick with an average porosity of 15 %. There are three potential source rock intervals in this region; Middle Jurassic, upper Cretaceous Garian Formation and the Eocene Bilal and Jdeir Formations. 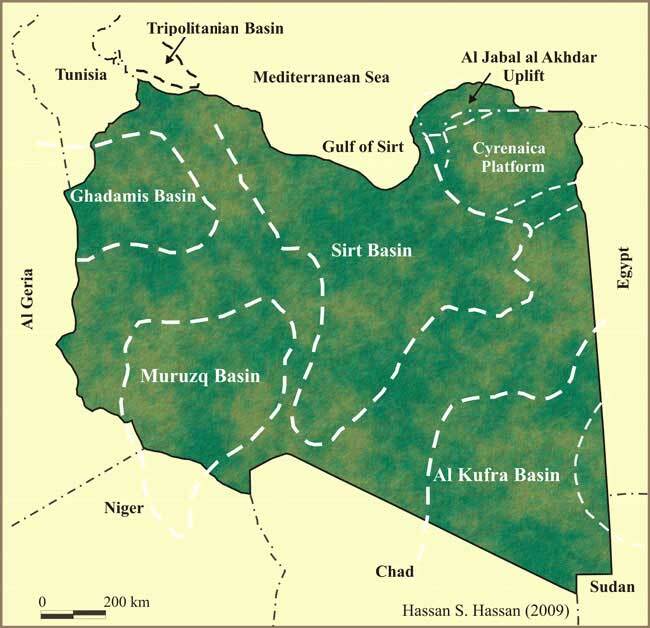 Ricchiuto and Pajola (2000) reported that the major source rock in this region is the Early Eocene organic shale known as the Jdeir in Libya and Bou Dabbous in Tunisia. The Ghalil Formation acts as seal rock for Jdeir Formation (see stratigraphic section). The trapping styles in the basin are mainly stratigraphic buildup and minor faulted structures.